Promotional materials and techniques used by Duxford Air Museum. Promotional materials and techniques used by Duxford Air Museum Promotional techniques are the methods used by Duxford to tell customers about its products and services and to persuade them to go there. They include advertising, direct marketing, public relations, displays, sponsorship, demonstrations and sales promotions. Promotional materials are the actual pieces of information that the customer sees, hears or reads. 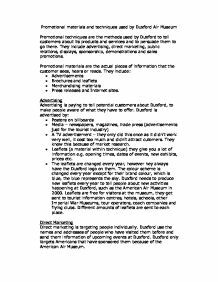 They include: * Advertisements * Brochures and leaflets * Merchandising materials * Press releases and Internet sites. Advertising Advertising is paying to tell potential customers about Duxford, to make people aware of what they have to offer. 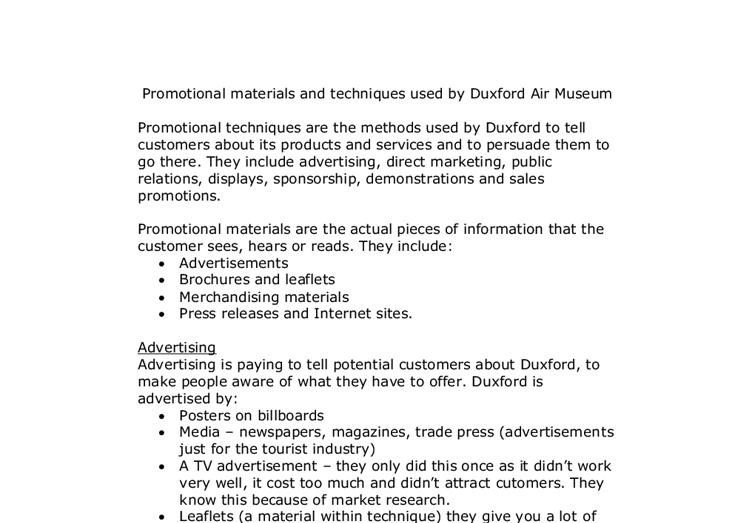 Duxford is advertised by: * Posters on billboards * Media - newspapers, magazines, trade press (advertisements just for the tourist industry) ...read more. Duxford needs to produce new leaflets every year to tell people about new activities happening at Duxford, such as the American Air Museum in 2000. Leaflets are free for visitors at the museum, they get sent to tourist information centres, hotels, schools, other Imperial War Museums, tour operators, coach companies and flying clubs. Different amounts of leaflets are sent to each place. Direct Marketing Direct marketing is targeting people individually. Duxford use the names and addresses of people who have visited them before and send them information of upcoming events at Duxford. Duxford only targets Americans that have sponsored them because of the American Air Museum. Public Relations Public relations are when an organisation has a good story about them in the newspaper, on the radio or on TV. ...read more. Film companies will also pay to use Duxford. * Word of mouth - people who have visited Duxford tell other people about their visit, Duxfpord will try and make sure they have a good time so that it is good things they will be telling their friends and family. * To create good Public Relations they let local people n free of charge, they offer a free bus from Cambridge and Blue Peter badge winners can also gain free entry. Displays Posters - the main form of display, most posters are just outside the museum and in the entrance, at tourist information centres, at the other museums that are part of the Imperial War Museum Group. They put posters on the London underground as lots of tourists use the underground and see the posters. ...read more. said, "Where's the beef?" "Here's the love." While McDonalds tries to build a sense of community and their promotions takes the emphasis off the food it sells and on to marketing love, a sense of community and good feelings. McDonalds have tried to make a McDonald land image for adults. * Billboard messages are delivered with continuity and frequency. * Directs potential customers/clients to your place of business * People can't "switch it off" or "throw it out." People are exposed to it whether they like it or not. In this sense, billboard advertising truly has a "captured audience." therefore I will be advertising on the fire at noon, because this way I am sure a lot of people will be listening. 3. I also found out that 50% of the people that I interviewed found out about other venues offering the same service in the newspaper. Describe the techniques used by Bartle, Bogle and Hegarty to advertise Levi's. Hegarty made sure that the song was also released as a single on the same day. Again in the advertisement "Pawnbroker", the old man gave money for a pair of Levi's which gave the protagonist a key to freedom. He then had money to buy petrol for his car so that he could drive away with his girlfriend. Today, consumers are increasingly influenced by the power of brands and designer labels. Controllable communication consists of marketing messages that are carefully directed to achieve an organisation's promotional objectives. These may include the following: Advertisements- messages sent to the media to inform or influence the people who receive them. The people signed up to the phone service will hopefully spread the word when they receive news of offers etc. Extra services such as weather, traffic, news and sports updates will also be included. A healthy profit is also wanted on the actual mobile phone service.